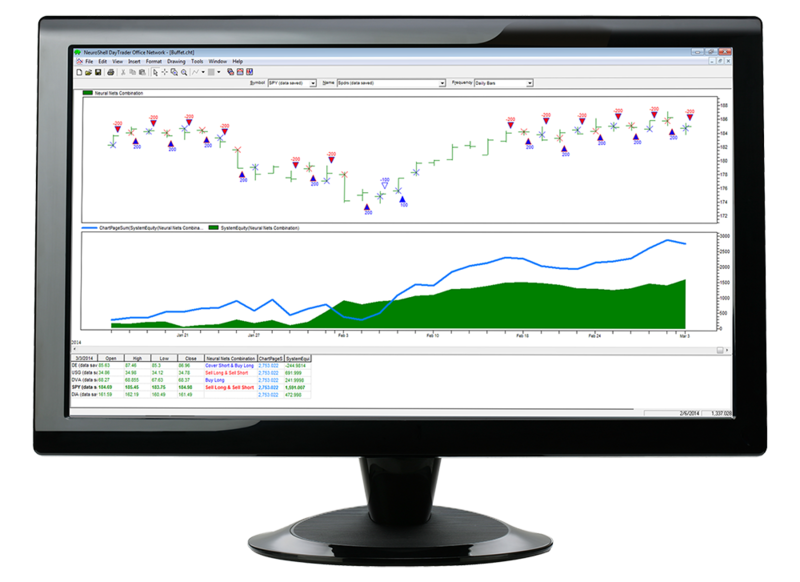 Take NeuroShell Trader for a test drive! 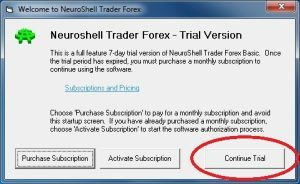 The 7-Day trial version of NeuroShell Trader Forex has all the functionality of NeuroShell Trader Forex, except that it is limited to FXCM Forex brokerage practice accounts. Even if you don’t have an FXCM account and are not interested in trading the Forex markets, you can still use the trial version to try out the powerful capabilities of NeuroShell Trader. The only requirement is that you sign up for a free FXCM practice account from which the Trial version will obtain data. How do I install and run the 7-Day Free Trial? NOTE: On some Windows 10 configurations the installation may appear to ‘hang’. However if left alone for a couple of minutes, the installation should eventually complete. b. 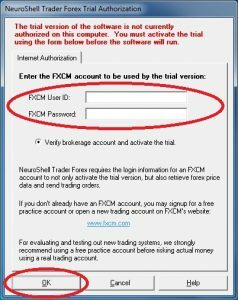 On the ‘NeuroShell Forex Trial Authorization’ dialog, enter your FXCM practice account User ID and Password from #1 above, then press OK.
c. Continue using NeuroShell Trader for the trial period. e. For even more in depth information and articles on how to use NeuroShell Trader visit our comprehensive technical support website : View Support Website. How do I lease or purchase NeuroShell Trader after using the trial version? To lease NeuroShell Trader Forex on a montly basis, simply press the SUBSCRIBE Now button to view different monthly lease options. Alternatively, press the PURCHASE NOW button to view the options available to purchase the standard NeuroShell Trader which can load many different asset classes (Stocks, Futures, Indexes, etc) from a variety of data providers and is not limited to FXCM or Forex data.